Custom made orthotics are specially-designed insoles which can help to treat a variety of common foot problems and gait problems. Podiatrists are the only professionals who are suitably trained and qualified to provide custom made orthotics in Perth, and have the best understanding about the mechanics of the feet and lower limbs. Conditions including heel pain and arch pain, flat feet, high arched feet, Morton’s neuroma and shin splints can be successfully managed through orthotic therapy in combination with other podiatric treatments. We use the latest in orthotic technology to manufacture custom made orthotics at Perth Podiatric Surgery. This involves using a 3D camera to capture an image of the foot and a detailed biomechanical assessment including visual gait analysis. Our orthotics are 100% locally made in Western Australia and generally take around 1 week to turn around from the date of scanning. 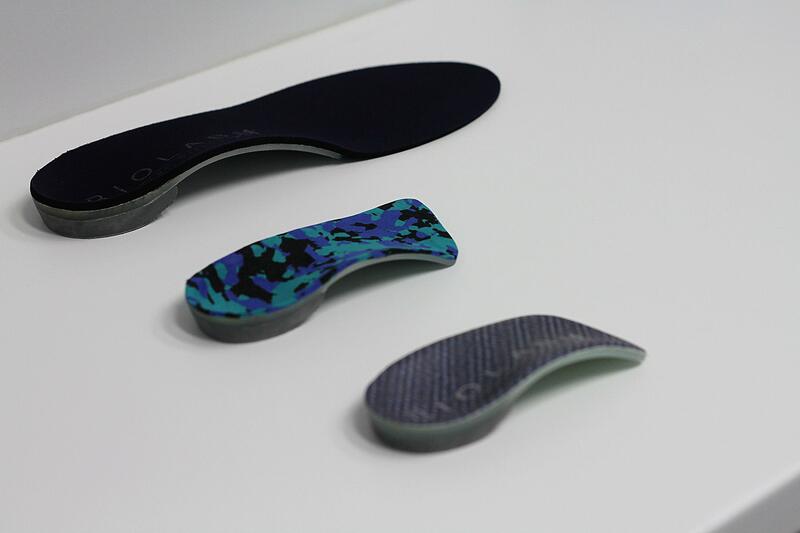 What are custom orthotics made of? The orthotic shell is made of a semi-rigid polypropylene plastic which is covered by a soft vinyl or neoprene material. They do not generally feel hard underneath the feet when they are worn and can be designed to fit in most pairs of shoes and sandals. Our experienced podiatrist and specialist podiatric surgeon will determine how much mechanical control is required in the orthotic in order to provide better alignment to the foot and reduce any excessive pronation. Our practice charges $850.00 (Current 24/02/2017) for a pair of orthotics to be made, which is inclusive of the Biomechanical Assessment and Orthotic Scanning Appointment, Manufacture of the orthotics themselves, and a Progress review appointment. All private health insurers provide rebates on custom made orthotics, and generally cover at least 50% of costs for the manufacture of the devices. Patient’s are therefore only required to pay ‘the gap’ on their orthotics, as most of the cost is rebatable on-the-spot via HICAPS. Occasionally, further modifications have to be performed on the orthotics after they are issued, but there are no additional costs incurred by the patient for this service. Perth Podiatric Surgery utilises state-of-the-art 3D orthotic scanning technology to create a product which is fully customised and durable. If you think orthotics could help your foot problem, book an appointment to see Dr. Knox today by calling 9383 3851 or booking online. How much do Orthotics Cost in Perth?